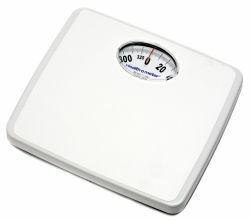 The Health O Meter 175LB has a capacity of 330 pounds and a readability of 1 pound. Ideal for the travelling doctor/nurse as well as in the bathroom, these high quality scales will give years of service with no batteries required! Travel bag available. 11 1/2 x 9 7/8"